A developer library that provides a set of functions for application virtualization: emulating a file system and a system registry for an application. Using these functions, you can create virtual files, fake registry entries, keys and values. x86 and x64 are supported. Samples for C++, C#, VB.Net, VB6, Delphi, Builder C++ are available. This is a programming interface to use BoxedApp Packer. Just specify files that should be packed together. 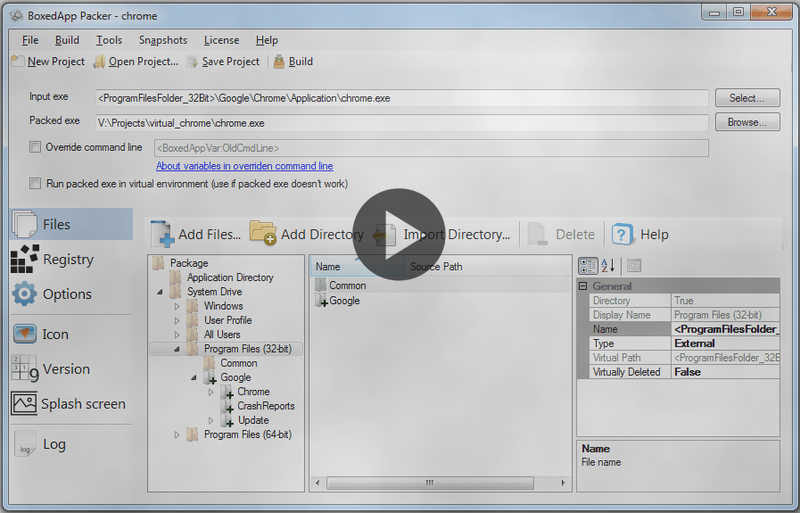 Create converters and packers: video to exe, flash movies to exe and others. BoxedApp is a family of products: an application virtualization tool to convert regular applications to packed ones, a library for developers to virtualize file system and registry, and a library to make custom packers. If you have a ready application and would like to make its portable version, or include dependencies into the application, then use BoxedApp Packer. If you are planning to create your own "packer", consider using BoxedApp Packer API. If you are a developer and want to hide usage of some DLLs, protect assets, use ActiveX without registration, run processes from memory, then BoxedApp SDK is for you. Want to see BoxedApp in action? Please enter a correct e-mail to get a demo version. If you don't receive a letter please write us.